Summary: The proposed renovation of the Fibropapilloma Sea Turtle Rehabilitation Facility at Clearwater Marine Aquarium will incorporate 1) new tubs and filtration systems, 2) floor decking, and 3) structural renovations of our facility including new ceiling supports sturdy enough to sustain scales. 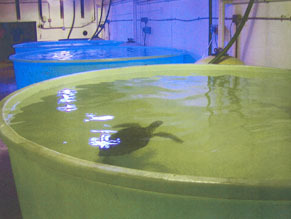 Currently, our FP facility includes three 300 gallon and two 400 gallon tubs and accommodates eight turtles. CMA will not turn away any FP turtle that is in need of care. The renovated facility will allow a larger quantity of FP turtles to rehabilitate at CMA and will provide a higher quality of care for these turtles. Although it has been a cramped space, CMA successfully accommodates any turtle in need of care. However, as our reputation of successfully rehabilitating and releasing FP turtles expands, we are in need of new equipment and space to adapt to these and future demands.